Used Troy’s honey butter on it as well. Thanks Troy! Because of your videos, I’m cooking different stuff. Wow. That looks incredible. Please tell where to find the recipe. Where can these Troy videos be found? Looks yummyyyy! Yes, please do share the recipe! Use the search function...it works pretty good. I searched "KFC" and got 30+ links. 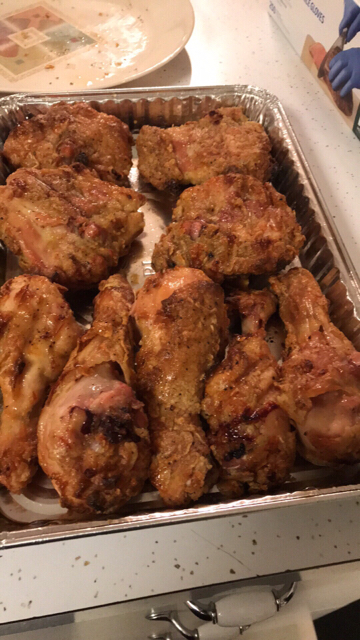 The KFC chicken turned out pretty good with the Slow N Sear. I messed up though and didn't use egg yolk in the batter. I just used some flour and seasoning. I didn't have any beer or sparkling water so I used Sprite. I think it made the mixture ok. I did two mixtures. One with flower and SPG seasoning another with just Mama Autry Chicken Seasoning. I only did the dipping twice like the video recommended. Did the batter first then the flour. The Chicken got a little over floury but still tasted great. I used too much SPG seasoning so the chicken was overly salty but what calmed the salt flavor down and ended up making the chicken fantastic was honey butter which was recommended in the video. Melted half a stick of butter with about a tablespoon of honey and brushed that on the chicken. The crunch on the chicken was amazing. My plan was to make these Sunday and eat them tonight. Well the family tried one piece and decided that's what was for dinner last night. haha. None left. Here's the recipe from the description in the video. 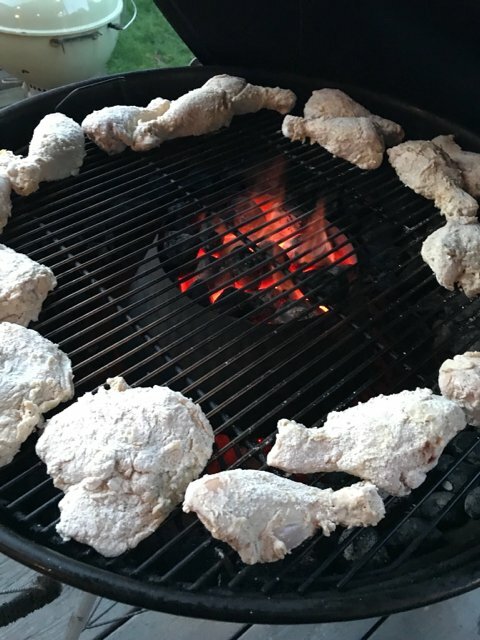 I put the Vortex up against the Slow N Sear to make a batch of KETTLE FRIED CHICKEN. I think the yolk helps the batter stick to the chicken better. My chicken was pretty well coated without the eggs. You have to get the right consistency with the wet batter is all. You could probably use mustard instead of eggs in the batter. Not sure how much of a taste would transfer over. I've read that some people cover their ribs with it and the taste doesn't transfer over.